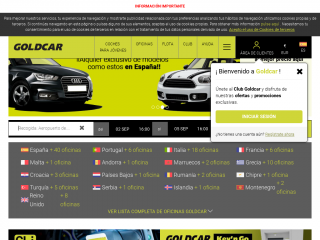 With over 30 years of experience, Goldcar sets the standard in holiday car hire in Europe and is a market leader in Spain and Portugal. We currently have more than 95 car hire offices, located at major airports and tourist destinations in Spain, Portugal, Italy, France, Malta, Andorra, Morocco, Greece, Croatia, the Netherlands, United Kingdom, Romania, Cyprus, Turkey, Serbia, Iceland and Montenegro. The list of Goldcar destinations grows every year, allowing travelers to get behind the wheel of the newest and best value rental cars on the market in ever more locations. Goldcar employs a highly skilled workforce of over 1,100 professionals dedicated to offering all our clients a quality, transparent, and cutting edge service.